Dear Dave and Nick...: Letter 92: The Work Programme. 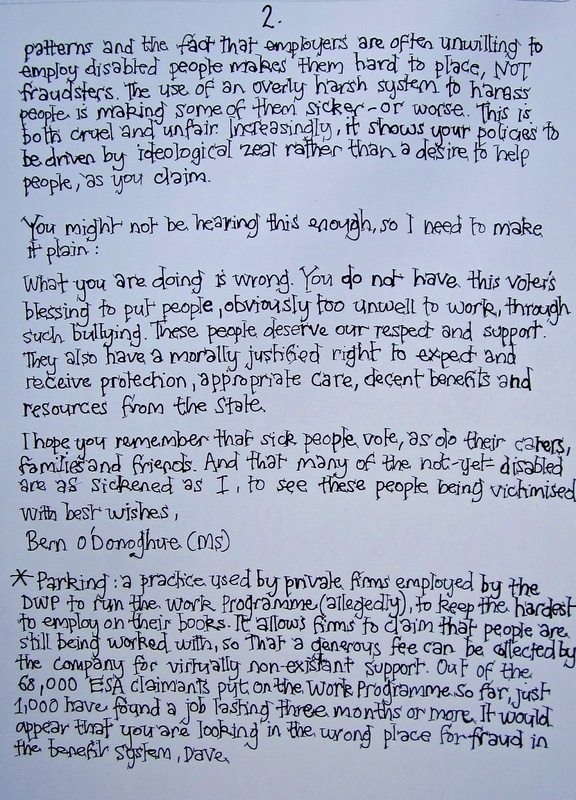 It's not the claimants who are the "lying thieving bastards"
Letter 92: The Work Programme. It's not the claimants who are the "lying thieving bastards"
"Who does Government work for? The electorate, or politicians? The answer lies in today's vote on whether or not to redraw the parliamentary boundaries before the next general election. Whom would this have served best? The Conservative party of course, remembering that at the last election you were 19 seats short of gaining an overall majority. If it's it true that there are currently approximately six million people missing from the electoral register, surely it's more appropriate to focus on people having a vote before redrawing any boundaries favouring your Party? Ah, but silly me, partisan politics doesn't work like that does it? Never mind, now the voting is lost and over, might we move back to important issues? It is said that the moral test of any society is how it treats the weakest members. If "Panorama The Great Disability Scam?" is anything to go by, British society is in a very bad way. In office, as Coalition, you work for us and I am ashamed of what you are doing to vulnerable disabled people under the guise of finding them work. Please - stop telling us that this payment by results system is working. Like the assessment process itself, it is deeply flawed. Please - stop private companies taking public money for poor performance. Was A4e not enough? Please - do something NOW to stop the bullying of sick and vulnerable people. Anyone with a shred of decency can see that a culture where claimants are nicknamed "LTBs" or "Lying Thieving Bastards" is one which needs serious overhaul. Problem is, employees of private companies who use this kind of language take their orders and their cue from Ministers at DWP, which suggests that it's there the problem lies. The sick are not scroungers. They are SICK, often having complex needs and unpredictable days of good and poor health - which your Programme seems to deliberately ignore. Such health patterns and the fact that employers are often unwilling to employ disabled people makes them hard to place NOT fraudsters. The use of an overly harsh system to harass ill people is making many of them sicker - and worse. This is both cruel and unfair - and starting to feel like your policies are driven by ideological zeal rather than a desire to help, as you claim. What you are doing is wrong. You do not have this voter's blessing to put people, obviously too unwell to work, through such bullying. These people deserve our respect and support. They also have a morally justified right expect and receive protection, appropriate care and decent benefits from the State. I hope you remember that sick people vote, as do their carers, families and friends. And that many of the not-yet-disabled are as sickened as I, to see these people being victimised. 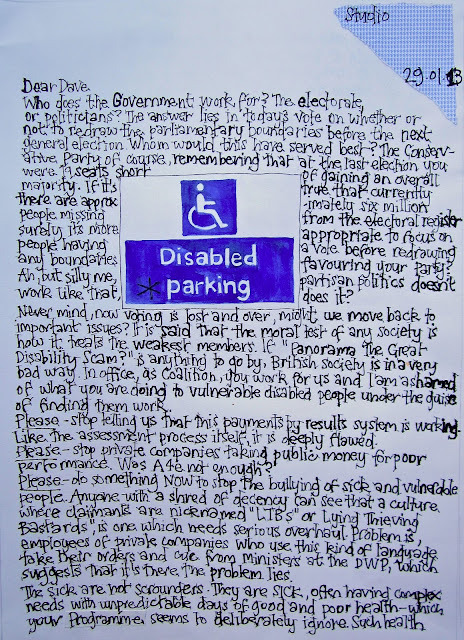 * Parking: a practice used by private firms employed by the DWP to run the Work Programme (allegedly) to keep the hardest to employ on the books, thus allowing firms to still claim they are being worked with and collect a generous fee for doing so. Out of the 68,000 ESA claimants put on the Work Programme so far, just 1,000 have found a job lasting three months or more. It would appear that you are looking in the wrong place for fraud in the benefit system, Dave." Thanks for your comment. The argument isn't lazy nor lacking in evidence - there are links within the letter that support it, plus the Panorama programme is pretty hard to describe as depicting isolated cases. The journalist who worked on it, herself someone who works and has a disability has written about her experiences making the programme, again strongly supporting the programme. Boundary changes - it is a good thing for us all if they are fair, but i think the pressure to do it now has less to do with democracy or fairness, than the Tory party's next election chances. 6 million voters unaccounted for seems more pressing to me. Please take the time to read the articles linked - they are uncomfortable but telling the truth.